1. $3,163 - That is the average tax refund for Americans who overpaid on their taxes. On average Americans do not withhold enough on their taxes. Three-quarters of Americans are refunded while only 19% of taxpayers end up owing money to the IRS come tax time. 2. 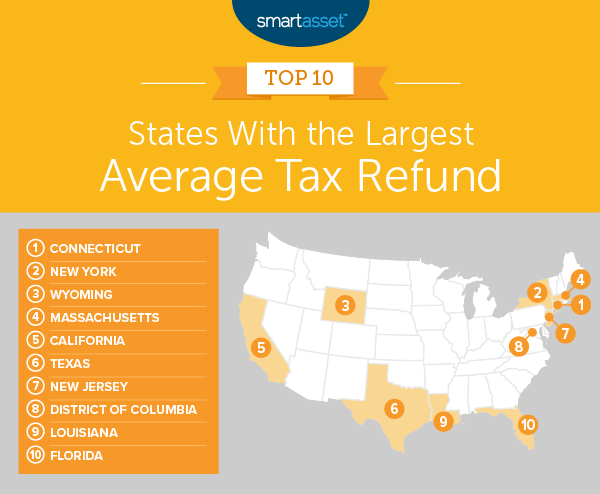 Northeast pays high taxes and receives large refunds – Four of the top seven states on our list are in the Northeast. These states tend to have higher-than-average income taxes, which may be why taxpayers there receive larger tax refunds. DEREK MILLER, CEPF®Derek Miller is a graduate of the University of Edinburgh where he studied economics. He is passionate about using data to help people make better financial decisions. Derek is a Certified Educator in Personal Finance® (CEPF®) and a member of the Society for Advancing Business Editing and Writing. He is a data journalist whose expertise is in finding the stories within the numbers. Derek's writing has been featured on Yahoo, AOL, and Huffington Post. He believes the biggest financial mistake people make is waiting too late to save for retirement and missing out on the wonders of compounding interest. Derek lives in Brooklyn.